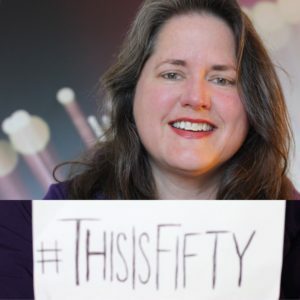 #ThisIsFifty Last week I hit the big 5-0 and celebrated by treating myself to a week of exploration, self-discovery and adventure in California. Here’s the thing. I LOVE time alone. I couldn’t function without it. I love my friends and family but I’m ultimately an introvert and need to refuel from time to time. I landed at LAX, hopped into my fully-loaded Ford Escape (I’m now a huge fan) and made a path to the big city. I drove through Hollywood looking for the #AWrinkleInTime billboard Ava Duvernay had featured on her Instagram page earlier in the day. I found it on Sunset Boulevard. 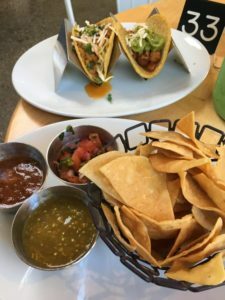 I drove through the Hollywood Hills just taking in the scenery and made sure to lay eyes on the Griffith Observatory and the Hollywood sign before heading north along the coast and eventually turned inland toward Santa Maria for the night. I love the ever-changing landscape in southern California. It seems around every turn there’s a new type of mountain or hill and the colors range from golden wheat to mocha brown. It’s all breathtaking and I am constantly amazed at my eyes’ ability to take it all in, in complete focus as I pan back and forth in awe. I arrived at my hotel well past dark after driving over a mountain. It was not my best choice but I didn’t make the same mistake the rest of the trip and planned evening arrivals better. 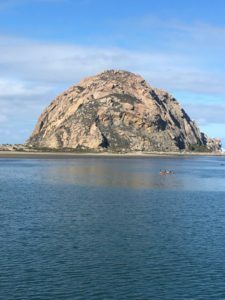 The next morning I mapped out a route up Hwy 1 with my first stop – Morro Bay. My love of animals and nature has no bounds and this stop filled me with delight. Seals were lounging on a platform just off shore. They were loudly barking at each other as they jockeyed for space. Out in the bay, otters floated on their backs and playfully swam while kayakers encircled them. Pigeons squawked and screamed trying to claim their space on the pilings under the dock and a lone seal swam by scooping up sardines under the dock. It was serene and beautiful and unpopulated – amazing considering how many people live in California. Morro Rock was just beyond the inlet and when I drove to that side, I was greeted by a bevy of otters just off shore. They were frolicking and swimming and lazily floating in the water. I could have watched them for hours if there hadn’t been other people around but there were so I made my way over to the shoreline where there were iconic cliffs and layers of waves rolling in and people with surf boards running along the sandy beach. Aside from the wind, it was serene. 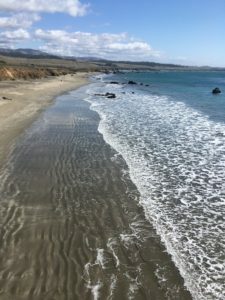 I got back in the car and traveled up the coast to San Simeon. San Simeon is the town where you can find Hearst Castle – the former estate of William Randolph Hearst. It sits high on top of the hill and is open for tours. I did not have time to spend so I just visited the Visitor Center and read the panels about the family. Imagine my excitement when I learned that one of the Hearsts was named Phoebe. It was Phoebe this and Phoebe that all over the panels and let me just tell you that it’s an exciting thing to see your name so many times when you have a name that isn’t as popular as Mike or Mary. I drove across the street and walked out a long jetty and just watched the raves crash underneath and dogs chase frisbees on the shore. So peaceful! The next stop again catered to my love of animals and my timing was perfect. 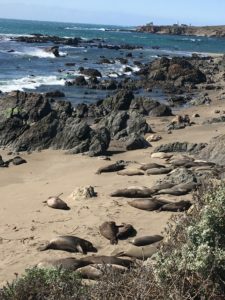 I pulled over at the elephant seal rookery and watched the young seals scream at their mothers any time the females rolled away and the pups couldn’t nurse. The males looked like huge blobs lying along the beach until one would get a little bit too close to another male and then they would thunder off down the beach like Jabba the Hutt, rolls of blubber undulating along the shore. They were massive. I had to turn around shortly after the rookery because a rock slide had closed Hwy 1 and there were no detours so I doubled-back along the coast and arrived in Santa Cruz just in time to pull over and watch a sunset. 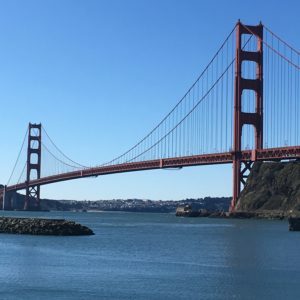 I crossed over the Golden Gate Bridge at night and stayed in Mill Valley overnight. The next morning, I drove to Sausalito and the Golden Gate National Recreation Area and bridge overlook. This visit made my heart sing. I lived in California for a short while back in 1989 and loved San Francisco and the Golden Gate Bridge. There’s just something magical about that area. On this visit, I Facetimed with my daughter while looking out at the bay, at Alcatraz and the bridge. I marveled at the technology that allowed me to share this moment live with my friends and family. It’s really a spectacular thing to be able to do that. Later I drove up to Calistoga and Napa Valley. When I lived out in Northern California (Vallejo, specifically), one of my favorite drives was along Hwy 37 from the Golden Gate Bridge across to Vallejo. There’s a stretch of road where you are on a straight away and there are flowers growing on either side of the road. In the spring and summer, I’d drive this stretch and red-winged black birds would fly back and forth across the road. I was thinking about this as I was driving this strip and no sooner had a recalled that memory than a flock of black birds flew in front of me. It brought tears to my eyes and I wept in gratitude for that moment. I don’t believe it was coincidental, it felt divine. I also marveled at the changes that had occurred since my last visit (27 years ago). Everyone always knew where Sky Walker Ranch was located but it was not labeled. Everyone knew that Robin Williams lived in San Francisco but he was allowed his privacy here. It made me smile when I saw the “Robin Williams Tunnel” in San Francisco and passed through “Lucas Valley” on my way to Napa (no relation to George Lucas) but it reminded me that Sky Walker Ranch was not far away. Napa this time of year is beautiful. 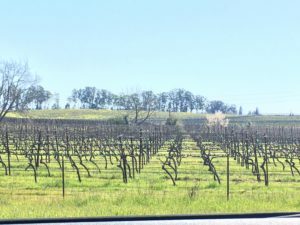 The vineyards are bare but yellow blossoms are everywhere and the contrast between the beautiful blue sky is breathtaking. I made my way to Milpitas for the night and was happy to find an entirely vegan restaurant for dinner (Loving Hut). I had a wonderful dinner and bought a chocolate hazelnut cake for dessert as a takeaway. At 9pm PST (midnight on my native east coast), I played a saved message from my phone of my mom singing Happy Birthday (she died in 2014 and ever since, I play this message on my birthday) and ate my slice of cake. 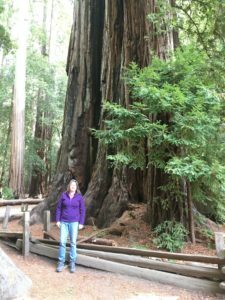 The 24th was my birthday and I decided to put 50 years in perspective so I drove out to the Redwood Forests of Big Basin State Park. These are not the largest redwoods in California but they are among the oldest protected forest in California. The age and size of these giants reminded me just how small we are in the world. It’s good to be humbled in life. 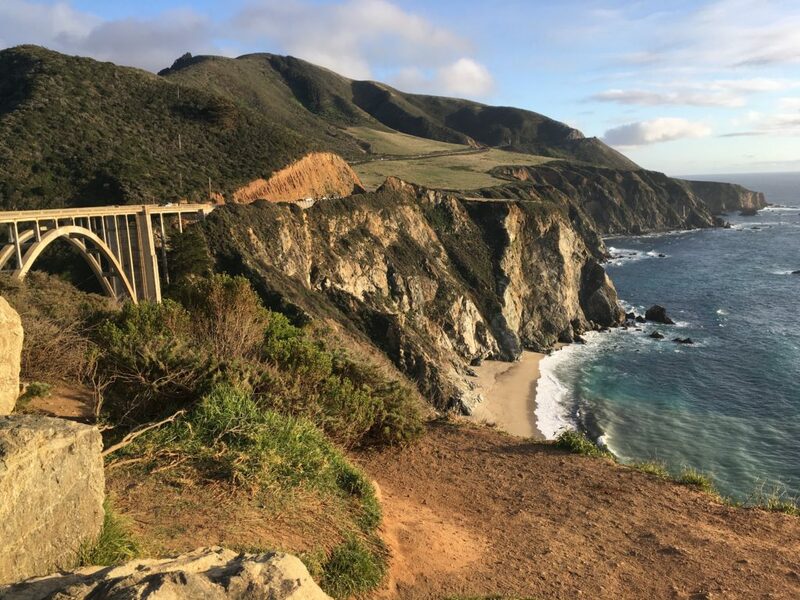 I drove from the forest to Monterey, Carmel and, finally, Big Sur. Incredible views there! I traveled a loooong way back on Hwy 101 and again slept in Mill Valley for the evening though at a different hotel this time. The next morning I drove back toward Los Angeles. 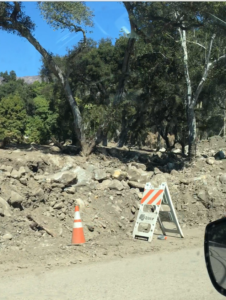 I wanted to stop in Montecito and Santa Barbara to see if there were still signs of the wildfires and mudslides that we saw on the news a few months back. There were signs of the wildfires but also signs that the area was springing back to life. 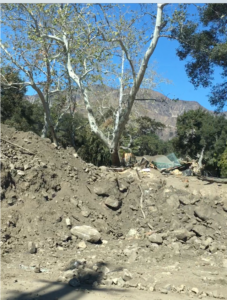 I knew that Oprah’s property had seen some of the mudslide damage so I drove to the outer rim of her property to see if damage could still be seen there. Along the way, there were signs that something had happened. The road was free of debris but also was dirty/mud stained. I saw signs directing residents where to leave their sand bags for collection. 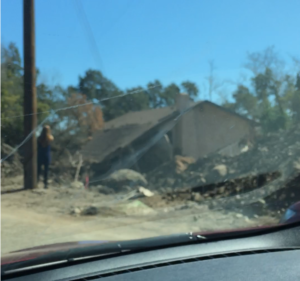 I turned the corner onto a neighborhood road and rounded the turn and that’s where I saw the devastation. 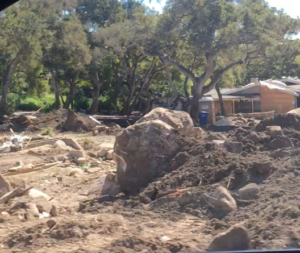 Both sides of the road were piled high with debris and dirt and boulders – BIG boulders. Boulders the size of cars and houses. And then I saw them – the remnants of homes. The outer shells of homes – like boxes with the bottoms blown out. Just the square shape of the house with a roof over the top but nothing in the center. There were several houses like this. I don’t know if this is where people lost their lives but they definitely lost everything they owned. It was sobering and humbling and sad. Mudslides are great things for what they are intended. Nature sends a wildfire which takes care of the underbrush and stimulates new growth. Then she sends rains and then she sends mudslides which combine ash and soil and she coats the area with nutrients. Some of this even spills into the sea and spreads nutrients and life out into the ocean. It’s a perfect system until you add people and pets and homes to the mix and then it is disastrous and devastating. Further down the highway on Hwy 101, I drove for minutes and miles where I saw not a single tree, shrub or blade of grass on the hillsides. They were charred and black and brown. On the other side of the highway were palm trees. Their trunks completely black but then…I noticed the hillsides had a few tufts of yellow and the palm trees were sprouting bright green mohawks. The area was coming back. Slowly but surely. Again, that message, you are small in the universe. You may accomplish great things here but they will be washed away some day. Nothing is permanent. You have to stay focused on THIS moment so I try to make the most of them. They are all we truly have. I walked the boardwalk in Venice Beach and stopped for dinner at my new favorite place – Tocaya Organica. 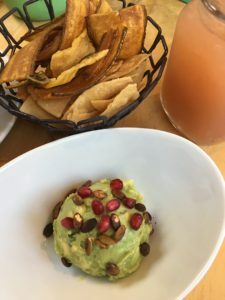 I had eaten at one in Malibu a few weeks before this trip and loved it and had been dying to go back. It did not disappoint. I drove through Hollywood again along Santa Monica Boulevard and Hollywood Boulevard and saw the scaffolding for The Oscars going up and preparations for the next day’s premiere of A Wrinkle in Time. I slept in Burbank for the night driving past WB Studios and the filming location for the Ellen Show. On my final day in town, it was all about A Wrinkle in Time (I hoped). I had put in for tickets to the James Corden show. The show said it would be focused on “an upcoming fantasy film” which I surmised MUST be A Wrinkle in Time (AWIT). There was a 12:30 taping and a 2:00 taping. The 2:00 was being filmed at James’ studios and listed the cast of AWIT as guests. There was a mystery guest listed for the 12:30 taping and it was being shot at The Pacific Theatres at The Grove. I visited The Grove on a business trip a few weeks prior so knew where they were located. I can’t tell you whether I was correct about my prediction for a while but will update when I can. After the taping, I made my way to my second favorite restaurant in town – the Veggie Grill. Their entire menu is vegan and they have a heavenly Beyond Meat burger on a pretzel bun so I had that. Delish! 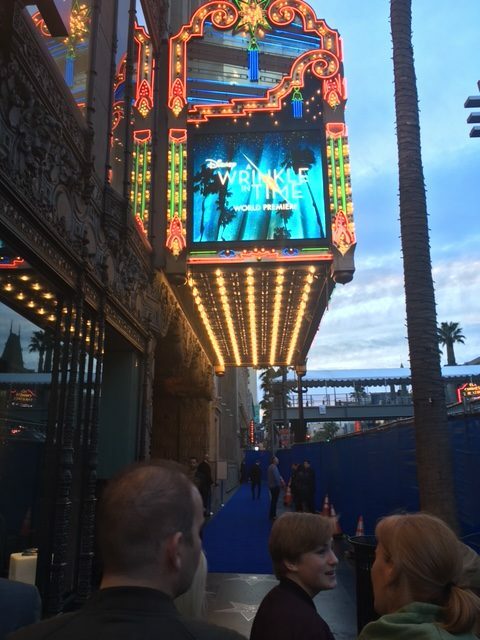 I drove around town and by the time I got back to Hollywood, it was time for the A Wrinkle in Time Premiere. I figured I would stand on the sidelines and see who and what I could see. I was hoping for an Oprah, Reese and Mindy sighting but that didn’t happen. I did not leave disappointed (okay, slightly disappointed) because I saw MANY guests including – Chris Bosh and Kobe Bryant, Bellamy Young, Angela Bassett, Tracee Ellis Ross, Eva Longoria, B. J. Novak , Janelle Monae, Anthony Anderson, Zach Galifianakis, Ryan Coogler, J.J. Abrams and Katie McGrath, Jurnee Smollett-Bell, Salma Hayek and a few others I am forgetting but no O. After it was clear I wouldn’t be seeing any more stars, I drove to my hotel near the airport and readied for my trip home. The next morning as I boarded my flight, I realized I had a center seat. No big deal. I figured I would read or sleep anyway but as I slid into my seat I bumped the guy at the window. I apologized and he said (with a big radiant smile), “Hey! Don’t worry about it all. No big deal. How are you doing today?” I just knew in that moment we were going to connect. I LOVE when people come to play. People that are open and friendly and genuine. That’s exactly who was sitting in that window seat. We talked and we talked and we were instantly handsy. We high-fived. We fist bumped. We elbowed and squeezed each others hands and arms. It was an instant, natural comfort and familiarity. My new friend has had a rough go – some run-ins with the law, some failed relationships and 7 or 8 children in the mix and he’s only 35. He told me he’d been visiting his son out in LA and was headed home and that he just felt that things were going to be different when he returned home. I could see it on his face and hear it in his voice. He believed that with every fiber of his being. It’s a beautiful thing to see when someone has made that choice. I assured him that if he set his mind to it, things WOULD be different. I know they will be and I know I am going to follow up and check-in and encourage and elevate wherever I can. We talked about how everyone needs a support system. I was lucky enough to have always had one. I know that is not the case for everyone so I am happy to fill that role for others whenever I can. I am the greatest behind the scenes, “you can do it!” cheerleader you’ll ever meet. I ended my journey with a handshake at baggage claim and started the long drive back home. (It took my twice as long to drive home as it did to fly across the country. Traffic!). I drove home thinking about my week and about the final hours of that trip. It was all perfect. It was all exactly what I needed. I don’t expect to be celebrating another 50 years on the planet. In fact, I think I’ll be blessed if I have another 20 but time matters not. Years aren’t important. Minutes and moments are and I lived in every one of them on this trip. Fifty is going to be a great year. I hope wherever you find yourself on the age scale, that your year is great too. Let’s all choose to make it so. UPDATE: That James Corden taping was all about A Wrinkle in Time. Here’s how the show went. You can even see me (in black and white stripes) when the audience is filing in.